Do you love the beach lifestyle of living near Holmes Beach, FL? There are many benefits to having easy access to the beach because you can enjoy the sunshine and sand throughout the year. Most of the time, Florida is a great place to live with the warm weather and beautiful scenery. But it can be a little stressful during hurricane season if a storm rolls in near your home. Here at Armored Dade Windows & Shutters, we know it is important to keep your home protected from hurricane force winds. If you are proactive and install high-quality windows right now, your stress levels will decrease when the storms come rolling through the area. 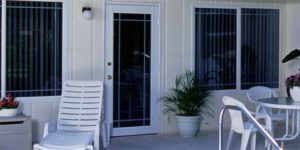 Here are a few things to know about hurricane impact resistant windows for your home in Holmes Beach, FL. It is a big investment to purchase a home for your family. As a homeowner, you need to protect your investment and avoid any damage. Even though natural disasters are unavoidable, there are a few things you can do to reduce the potential of damage during the storm. If your home is damaged in a hurricane, you could face thousands of dollars in repair bills after the storm is gone. Severe situations might result in a home that can’t be repaired because the damage was too extensive. Luckily, you can reduce the likelihood of irreparable damage by choosing hurricane impact resistant windows. Hurricane damage to the windows not only results in a situation where the windows need to be replaced, but you might also have to deal with other damage to the home. Investing in high-quality windows and doors is essential to protecting your family and belongings. These windows are known as the first line of defense during a storm. When the windows can hold strong against the harsh winds, you can block damage to the rest of the items inside. Broken windows create a weak point that can cause a chain reaction of damage throughout the structure. In most situations, the windows will break first, which then leads to structural damage as the storm continues. Broken windows open up space so that the strong winds can affect the air pressure inside. The wind needs to go somewhere and the pressure often moves in an upward direction. As a result, damaged windows can lead to a damaged roof. When the wind pushes the roof up, it could be torn off completely if the force is strong enough. Let this go on long enough and you are left with an irreparably damaged home. Decreased Neighborhood Noise: How often do you find yourself interrupted by noises in the neighborhood? These sounds could be cars driving by, loud kids, or barking dogs. Thin, weak windows will allow noises to come inside and interrupt your peaceful living space. On the other hand, high-quality windows help block the noises out so you can rest. Improved Property Value: As a homeowner, you always want to improve the value of your property. Certain home upgrades, such as installing high-quality windows and doors, can be a great way to boost property value so you can maximize your equity. Manage UV Exposure: Even though you can’t see the UV beams that come in from the sun, this exposure can cause damage to your furniture and carpets over time. UV rays will fade the fabrics, resulting in a situation where you need to replace the furniture to manage the appearance of your home. High-quality windows can be produced with special glass that reduces UV exposure, which decreases the fading and wear and tear that often occurs. Boost Energy Efficiency: The insulation of these windows is a great way to improve the energy efficiency of your property. The windows will keep your home sealed, protecting it against temperature changes when the air conditioner is running. Are you interested in experiencing these benefits for your home? Talk to an experienced contractor that offers installation of hurricane impact resistant windows and doors. You can customize your order, choosing the products and features that best meet the needs of your specific home. At Armored Dade Windows & Shutters, we are here to help! Call our team to schedule a time for a consultation and free estimate. You are welcome to visit us at 8112 Cortez Rd W Bradenton, FL 34210. Or call ahead to set up a time to talk to a windows expert: (941) 798-9010.